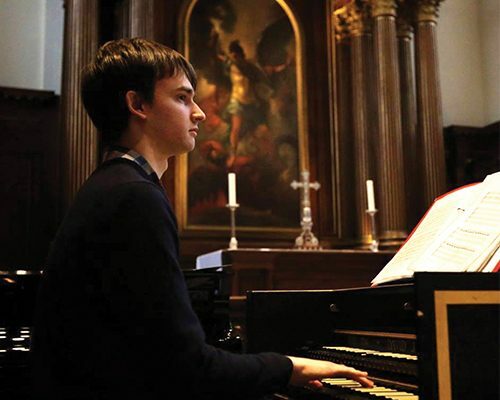 Old Blue Edward Reeve (2013) has been playing the piano since the age of seven, completing his Diploma of the Associated Board of the Royal Schools of Music when he was 14. He gained the Licentiate of the Royal Schools of Music at the end of 2011 with distinction, achieving the same qualification on the organ in July 2014. Edward is a past recipient of the Sheila Mossman Award, and was twice successful in completing the Regional Auditions for the BBC Young Musician of the Year competition. While he was at Blue Coat, Edward achieved 11 A*s and two short course A*s in his GCSEs, and A*s in Music, Chemistry and German – and an A in English – at A Level. During his time at the School, he performed (on organ, piano and cello) and conducted on numerous occasions, and had an opportunity to perform his own concerto. 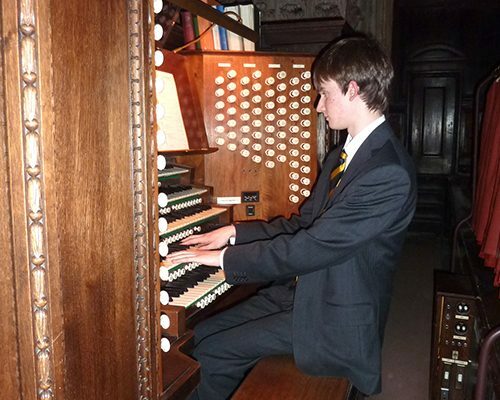 After Blue Coat, Edward was the Organ Scholar at Salisbury Cathedral (where he recorded 16 discs of organ music on the Cathedral organ) during his gap year, before going on to read Music at Queens’ College, Cambridge – also as Organ Scholar. At Cambridge, Edward attained a Double-Starred First Class in music at Queens’ – and came top of his year group all three years (which is referred to as ‘topping tripos’). He graduated in June 2017 with a Double Starred First in Music, and now holds the Aliki Vatikioti Studentship at Queens’, studying for an MPhil and PhD in late nineteenth-century music, supervised by Dr Martin Ennis. He was appointed Student President of the Cambridge University Musical Society for their 2017-18 Season. Edward has been fortunate to have had the opportunity to perform piano and organ concertos with a number of orchestras and, as a musical director, he has conducted numerous performances, several with the Empyrean Ensemble, which he founded in 2016. Edward has also been Assistant Musical Director for several Cambridge productions and was appointed as the Associate Conductor for the Brandenburg Choral Festival of London. In April 2017, Edward directed his own festival – the Cambridge Brahms Festival – featuring a series of concerts across the city, with visiting speakers and over 100 performers. Other activities in Cambridge have included being on the Instrumental Award Scheme and CamRAM scheme for two years, being Assistant Musical Director for the Cambridge Greek Play 2016 and being the principal continuo keyboardist for the Collegium Musicum. As an organist, Edward has given recitals in venues such as Salisbury Cathedral, St. Paul’s Cathedral, Reading Town Hall and King’s College, St. John’s College and Trinity College, Cambridge. In summer 2016, Edward returned to Blue Coat to play Beethoven’s Third Piano Concerto with the Aldworth Philharmonic Orchestra.